My journey in the World of Warcraft really started in Warcraft 3. The story in WC2 had hooked me in enough to want the sequel, but at that point it was still "just another computer game". The introduction of heroes, however, really sparked my interest; I'm not enough of a role-player to be on an RP server in WoW, but I *am* enough of one to be attached to particular characters and their story. As I played, a few characters stood out for me - Tyrande Whisperwind, the reclusive but powerful night elf priestess/ranger of Elune; Rexxar, master of beasts; Jaina Proudmoore, the career-minded young archmage and peace keeper. 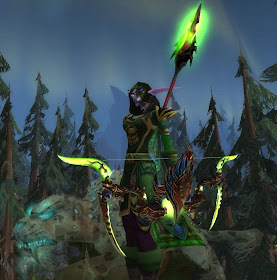 Unfortunately for me, the one character I really wanted to play when I loaded the beta version of WoW up wasn't there: a version of the dark ranger, Sylvanas Windrunner. The choice I made to become one of Tyrande's loyal hunters (blood elves weren't an option back then, or I would have considered one of those instead) has always bothered me slightly; given a second choice I might have packed my books for Theramore for some freezing instruction from Jaina, but although a human mage was an option, I feel no loyalty to Stormwind. Now, more than ever, I kind of wish I *had* joined the Forsaken. A quest line has emerged in WotLK beta (spoiler: http://blizzplanet.com/content/911) that heavily involves Queen Sylvanas, and makes (to me, anyway), Horde look so much more appealing. I'm not going to give up on Phyllixia - I have, after all, invested a LOT of time in making her who she is - but I'm sure even Tyrande will understand if I feel like spending more time in Theramore. "Hunters don't just rock, we RHOK!" Dual spec: Advent of the Cookie Cutter? This page brought to you by Phyllixia of Ashes, US-Khaz'goroth. Powered by Blogger.